Beautiful View! Equipped with lots of extras! Loved our view, saw dolphins, stingrays, manatees and lots of jumping fish from the balcony! Beautifully decorated! Lots of beach gear, and a plus for my husband were the fishing poles! Hope to come back again soon! Great to hear that you had another good stay at Land's End!!! :-) Thank you for the suggestion, we will be sure to pass this over to the owners for their review. Thank you so much for being a repeat guest with us and we look forward to your next Land's End getaway!! We’ve stayed in the same condo for the last two years and have been going to Land’s End for the last 5 years. We love the location, the wildlife, and the staff. We will contribute to vacation here for years to come! We love it!!!! :-) So glad you are happy in this premier condo at Land's End!! Looking forward to many more visits! The unit was very nicely decorated. We had a great time and the unit was really nice. Wish they would have supplied more things, like beach towels, beach umbrellas that weren't broken, more than 2 beach chairs, and maybe a cooler. We have stayed at Lands End a few times, and the units have always supplied beach stuff. Thank you for your post, we are glad you had a good time and enjoyed this condo. We apologize if you did not find the beach items that you were looking for. With each condo being privately owned, the inventory that you find in each will vary. Beach towels are not a required item for the owners to leave in the condos as we have found they go missing on a regular basis, which is quite unfortunate. As far as beach chairs and umbrellas, if those are not in the condo please contact us at our office as we do keep a supply here that we are happy to help with for the duration of your stay, based on inventory. Thank you for choosing to stay with us and we hope to see you back again soon! We've stayed at Lands End 3 times in the last 4 years and love it! This unit was by far the best we've stayed in with updated furnishings, fully equipped kitchen, and beautifully decorated. We will definitely being staying in this unit again! So awesome to hear!! 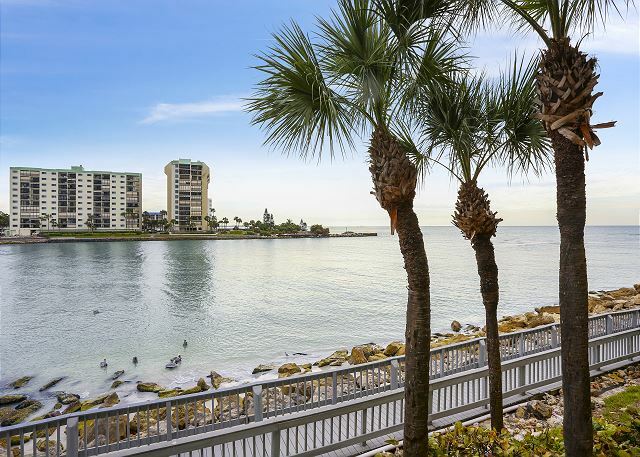 :-) This condo is one that falls into our premier category carrying recent updates.....and then you add the location of this building and the water views, its just AWESOME and we are glad you enjoyed! Thank you for being our guest and we look forward to your next Land's End vacation with us! The unit is clean and well appointed. There were even some games and movies for the kids. The owners were very responsive to questions before the trip. Very accommodating and helpful. The covered parking and gated community was a nice surprise. Very quiet and peaceful. We'll likely stay here again if vacationing in St. Pete. We had a great time! We spent 10 lovely and peaceful days at Lands End, sighting dolphin and manatees from the patio. The unit is well maintained, with very comfortable beds. Beach access is very convenient, and 20 people on the beach at the same time would be considered a mob. Most days felt like our own private beach. We had a truly wonderful vacation. Thank you so much for the post! The location of Land's End really does make you feel like you have your own private beach and we are so glad you enjoyed that!! We hope to have you back for another visit soon! We had a wonderful trip. I think we have definitely found our new vacation spot.. One of my families best vacations ever.. So awesome to hear!! :-) We look forward to having you back to create more family memories soon!! We always have a fantastic time staying at Land's End! Will definitely be back. This was our 3rd year staying at lands end. One of our favorite vacations. We saw dolphins, manatees, sting rays, hermit crabs, crabs, and of course fish. Condo was clean and comfy and staff was helpful and friendly. Highly recommend. Our stay at Land's End was very enjoyable. View across the Waterway at night was super! The suite had everything that was needed (and more!). It was clean and neat. Many thanks for such a great selection of CDs! The master suite had an awesome view of the water and the balcony was a great place to relax in the evening with a glass of wine and watch the boats go by. Our only disappointment was the guest bedroom, which was very dark and gloomy. The pool was close by and the grounds were beautifully maintained. You can enjoy greats walks along the boardwalk & beach. Great place! We really enjoyed the condo and the entire complex. Though not in the middle of 'touristy' areas, it was a clean, well-appointed facility that gave us access to all that we wanted. Great pool plus easy access to the beach with a very short walk across a little bridge protecting the beach plants. The unit was lovely and perfect in all aspects, and exactly as depicted in the online pictures. The view from the patio is beautiful, and watching all the pelicans and gulls swooping and diving for their food was so much fun to watch. The weather for the entire week was wonderful, giving us lots of relaxing beach time. The location has been the best that we have stayed at. The bay on one side & the beach on the other side! Hands down great property, great location. The only problem we had is the sheets on the bed, the bottom fitted sheet was not deep enough & would not stay on bed, frustrating. Do not like sleeping on mattress pad. That was only problem. Second time staying at this condo. Safe, fun and beautiful. Bad weather this trip but will be back. We loved it. Beautiful view. Wanted a relaxing week with a nice view and thats what we got. Condo was exactly as stated and we can't wait to come again. We so enjoyed our condo at Land's End. It lived up to all our expectations. We stayed in Building 5, Unit 202 and it was comfortable and was our home away from home for a week. Loved watching the dolphins and manatees swim by, the birds that came to visit every day. We hung out and just relaxed and enjoyed the beach and pool. We came down for our daughter's graduation and after a busy weekend, enjoyed out time at Land's End. Fantastic location. View from balcony was wonderful. Watched dolphins swim nearby. Unit was exactly as pictured. Very clean. Property management personnel very helpful. Would definitely stay there again. Condo is nice had a great time! It was our second time renting a condo at Lands End and I am pretty sure it was not the last time. We love the location, the condo and the service from resort rentals. It is family friendly, very clean and overall such a great place to spend some quality time with the family. Thank you! Close by eating places to enjoy. Leverocks and Verduccis. Wonderful boardwalk for a stroll or serious walking. Great private beach. Excellent water view. Well supplied kitchen. Good appliances. Comfortable furniture. Hope to return next year..
One of my best vacations! This condo was everything we wanted. To start it was very clean, spacious and very well maintained. The views from the private balconies were amazing. The sunsets were incredible. The beach was clean with soft white sand. Never crowded. The pool was also very clean and spacious. The island its self has alot to offer. I love this place. I plan on returning. Everything was just perfect! The view from the bedroom and the balcony, the sunshine for breakfast, the only 2 minutes walk to the beach, the staff, the wonderfull walk along the Beach to caddys.... Really everything!!! We will come back! Condo was nice. Everyone was helpful and nice. Felt very secure. Our trip was fantastic. The property was gorgeous. The view from the balcony was of the ocean and bay. We saw dolphins every day playing in the bay which we loved. The property and pool were always kept really clean. The staff was very friendly as well. The water in that area is also full of life. We brought our snorkel stuff and found star fish, sand dollars, conchs,and a huge horse shoe crab. A few fisherman also let us join them in their fishing off the pier that wraps the property. We will probably make this an annual trip. What an incredible property! The complex starts where the road ends. Overall the complex is typical. Nice pool area, sporting activities on site. Sport equipment available to checkout (no cost). One note, the grills are charcoal. Walk from condo to beach is 1 min, condo to pool is 2 min. This unit is in a great spot. The afternoon sun stays off the balcony so you can enjoy it in the summer. If you are on the gulf side you get blasted by sun. On the intercoastal side you get to enjoy bar bands playing until the wee hours. We opened the bedroom patio door and listened to waves all night. Saw dolphins most every night where the intercoastal meets the gulf. Saw a manatee one afternoon coming along the rocks. Under building parking is really nice. The only downside for me is the boardwalk around the complex. It's like having a sidewalk just beyond your balconey. If you are looking for high energy activities and a staff of people to wait on you this probably isn't for you. If you are looking for a quite, safe, relaxed, upscale, family friendly place where you have everything you need to take care of yourself, I would recommend it. Awesome weather-great time. Condo super condition. Wi-Fi connected this year which was great. Our trip was excellent, the condo was very clean and comfortable . Just a short walk to the beach , beautiful board walk, great deck to sit outside and have your morning coffee in the sunshine . Planning on having the same experience next year. We have been renting at Land's End every year starting in 2007. We love the property, the friendly residents and the location. So do our children and grandchildren. So far, no surprises! We have booked 2 units for 2015. Wir hatten diese Wohnung im September 2013 für 3Wochen gemietet . Es blieben keine Wünsche offen, super eingerichtet, sauber und ein toller Blick aufs Meer. Die traumhafte Lage ermöglicht es , vom Balkon und sogar vom Bett aus Delphine, Manatees uns Stingrays zu beobachten. Wir hatten einen tollen Urlaub und kommen gerne wieder. We always have a great vacation staying at Land's End. The property's landscaping is beautiful. This unit was comfortable to an extent. The beds could have been more comfortable. The master bed had some sort of uncomfortable mattress cover that sounded like paper and the mattress was way too firm. It was a little difficult to get rest other than the naps on the beach. The rest of the condo was great. We have stayed at Lands End many times, and will continue to do so. This condo was beautiful! We had plenty of room for 2 adults and 2 Tweens. The condo has a beautiful view of the intercostal and ocean. The beach area and pool were a very short walk. There is a nice boardwalk that easily routes you to the beach and pool areas. There is a hot tub in front of this unit. However, children under 17 are not permitted. This rule is strictly enforced. The property and unit were all very well maintained and super clean. The master bedroom is quite large and the bed is firm. The kitchen is well equiped. i dont think there was anything we were lacking. The owner was very accommodating and easy to work with. The beach area is gorgeous!!! We saw manatee and dolphins, lots of wild life! We had a very relaxing time and enjoyed ourselves tremendously. While you are there try the Tropics dolphin tour, Florida Groves winery, and Frenchy's on the beach. This was our second time using Resort Rentals for coordination of rental. For ease of payment (acceptance of credit card for payment) they get a good rating. There was an error in billing which they quickly resolved. However, my husband had to be persistent in having another issue addressed. I believe the owner was likely instrumental in helping to resolve the concern, which allowed us to truly relax in a secure and breath taking environment! I would still highly recommend this Lands In property and specifically this unit and owner. My mom rented this unit in the past we loved it than,& we love it now! We had a great family vacation...hope to have many more! My husband and I and our girls had an amazing time staying here. The unit was very clean, updated and spacious. There was plenty of room for the girls to spread out and play. We loved the boardwalk that circles around the complex and took many walks in the evenings. The beach is so close, and we were pleased to see that it was not as busy and packed with people as many other beaches are. The girls also loved the pool which was great! One of our favorite things to do though was sit outside on the balcony. The view is great and every morning we watched manatee swimming back and forth. Also, on three evenings during our seven day stay we got to watch dolphins directly in front of the balcony!! We couldn't have asked for a better experience! We'd definitely return!! Everything was fantastic. We have been here in the past. The only two things that were dissappointing is the lack of a wireless connection for our tablet and ipod and the very dissappointing lack of the GOLF CHANEL DURING THE MASTERS. PLEASE PUT THE GOLF CHANNEL BACK ON. Enjoyed out stay very much. Watching the birds and the dolphins was wonderful. Walking on the boardwalk and on the beach was lovely. And the pool was enormous, clean and sparkling. very quiet beach. almost private. clean condos and very well located to access activities in the area. music from night clubs across the canal was annoying at times. Should warn customers on this before they rent. My family loved it! We especially loved how quick we could get to the beach. Everything looked great. We are planning on coming back next year! Great and no Nazi Life guards during this week as opposed to the week before and after Easter. Really, those guy's need some training before dealing with the public. We spent the month of January in building 5 #202 of lands end. Beautifull spot. Nicely maintained. Quiet, but interesting location. Walk every day until you can't any more. We had a wonderful vacation at Lands End and would go back anytime. maintained. The property is managed very well with very efficient and friendly personnel. Clean, spacious, met our needs for a relaxing vacation. Strengths: Proximity to ocean, large pool, covered parking. Love this complex, have stayed a few times in different condos. Grounds are beautiful and all is well maintained. Huge pool, mostly older crowd, so it's quiet. My unit was nice, updated granite kitchen, but living area a little dated. Even so nice and comfy, the bed was hard with plastic cover, that would be my ONLY complaint. Love this place!!! We had a great time at Land's End. This was our second visit and we were just as impressed this time as the last. The room was clean and spacious. The view from the balcony was brethtaking. My kids had a great time at the pool, so much so I had a hard time getting them out!! Only 1 complaint - The light in front of our door was out and was very dark when we would come home at night. I reported it to security but it was never fixed. I wasn't extremely worried as it is a gated community but would have liked to have the light for extra protection. We will be back to Land's End next year. the location is PERFECT! We have vacationing @ Land's End for 7 years straight now and it is the only place we will stay. 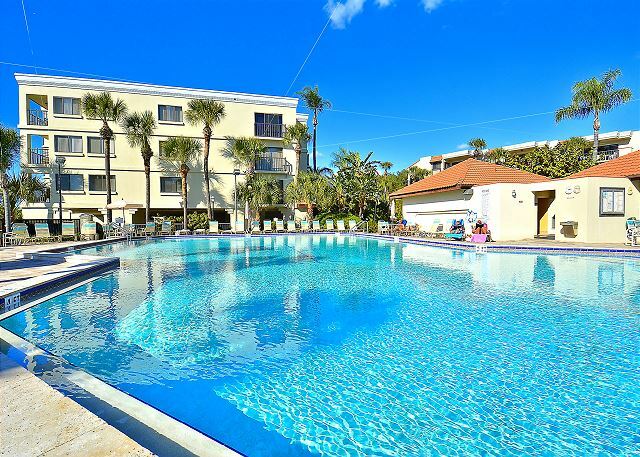 From the clean, private beach to the wonderful boardwalk surrounding the complex, you will love it. Thumbs up. Everything was good except the weather. While reasonably clean picked up stuff from under sofas, pull-out couch, bed, etc. This was our first experience with renting a condo in Florida and overall we were very happy with it. If the weather had been better we would have been happier yet. Did alot of traveling around while we were there checking out other areas and this was the area we liked the best so far.